During the first half of the 20th century the Maine Central and Boston & Maine spent a great deal of effort and money patronizing the busy Boston to Bangor corridor where their trains interchanged at Portland Union Station. There were three notable limiteds running the Atlantic coast including the Pine Tree, Kennebec, and Flying Yankee. The latter made headlines during the mid-1930s by launching an articulated, streamlined trainset and all three received lightweight equipment after World War II. Unfortunately, rail travel quickly eroded after the war and this issue was greatly emphasized in the Northeast where cities were in close proximity to one another. Both the MEC and B&M began downsizing operations by the mid-1950s resulting in all three trains mentioned above being canceled by the end of the decade. Thoughts of streamliners often do not come to mind regarding New England railroads. However, the three largest systems (New Haven, Boston & Maine, and Maine Central) all operated some type of service utilizing lightweight equipment. The most notable was the joint Flying Yankee three-car trainset launched by the B&M and MEC in 1935. It was manufactured by the Budd Company of Philadelphia and was nearly identical to the gleaming, stainless-steel Zephyr with which the Burlington had dazzled the public a year earlier. When the Yankee arrived at the B&M (the railroad owned the trainset outright although it was publicized as a joint train with the MEC and carried the Central's markings) on February 9th it officially became the first streamliner to serve New England, barely eclipsing similar efforts under way by the New Haven. 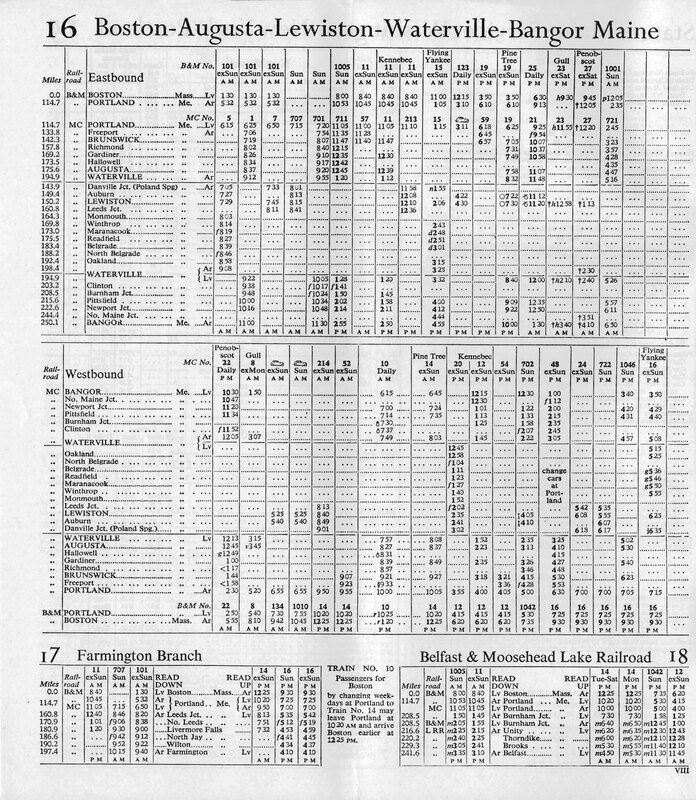 On April 30, 1928 the railroads launched the first of several limiteds serving the busy Bangor to Boston corridor with connections made at Portland, Maine. Known as the Flying Yankee the train was all-steam powered carrying heavyweight equipment including a baggage-coach-combine, standard coaches, a diner, two 26-seat/1-drawing room parlor cars, a broiler-buffet-parlor, and a parlor-observation. When the #6000 trainset arrived from Budd the train's s name was transferred to the new streamliner upon its inauguration on April 1, 1935. The decade also witnessed two other runs joining the Yankee including the Kennebec and Pine Tree (both were first known as the Kennebec Limited and Pine Tree Limited). However, they continued carrying traditional heavyweight cars until after World War II. After the war both roads embarked on a program to significantly upgrade service to the busy "East Coast Artery." During November of 1945 they placed a joint $2 million order with Pullman-Standard that included 24 new, lightweight cars which sported a stainless-steel look somewhat mimicking that of Budd's (however, the latter's patented shot-welding technology could not be used without paying royalties and Pullman sidestepped this by bolting the steel directly to the cars' sides). The equipment included 16 coaches (56-seat with 10 seats reserved for smoking), four restaurant-lounges, and four baggage-coaches (36 coach seats with eight also reserved for smoking and a 29-foot, 6-inch baggage section). The entire order was split amongst the two carriers (each received 8 coaches, 2 restaurant-lounges, and 2 baggage-coaches). Between May and August of 1947 the entire set arrived and in typical Boston & Maine fashion the railroad, in conjunction with the Maine Central, held a contest using school children (grades 5 through 8) to name all 24 cars. According to Kevin Holland's Passenger Trains Of Northern New England, In The Streamline Era the B&M had their entire lot named after birds (including the state birds of Massachusetts, Vermont, and New Hampshire) while the MEC named theirs as follows; the coaches carried Native American heritage, the baggage-coaches recognized Maine's forests, and the restaurant-lounges honored regions within the Pine Tree State. The Pullman equipment was a remarkable departure from the heavyweight cars featuring beautiful interior colors of green, blue, red, brown, cream, and yellow. Mr. Holland's book points out that the most striking feature was the restaurant-lounges featuring a bar-lounge and unique dining table arrangements. For power the railroads acquired sets of Electro-Motive's streamlined E7A diesels; the B&M purchased the most, 21 examples numbered #3800-3820 while the MEC picked up 7 for its operations, #705-711. Since the two roads were under common management (since 1933 known as the "Cooperative Agreement") all of the locomotives sported similar liveries of deep maroon (i.e., "Tuscan Red") with gold trim in two variations (an all-maroon with pinstripes and a more exotic, two-tone scheme featuring maroon on the front half and aluminum-gray along the rear with a large, lightning-stripe gold band evoking memories of Rock Island's Rocket livery). Alas, all three trains saw short-lived careers in their original form. By the early 1950s, despite their best efforts, both the B&M and MEC recognized that the traveling public was abandoning trains for highways and airlines. This issue was compounded on the B&M, which under the new management of Patrick McGinnis (1956) spent great effort cutting back services while attempting to implement new lightweight Talgo trainsets from American Car & Foundry (power came from Fairbanks-Morse's "Speed Merchant" locomotive) that proved a disastrous failure. 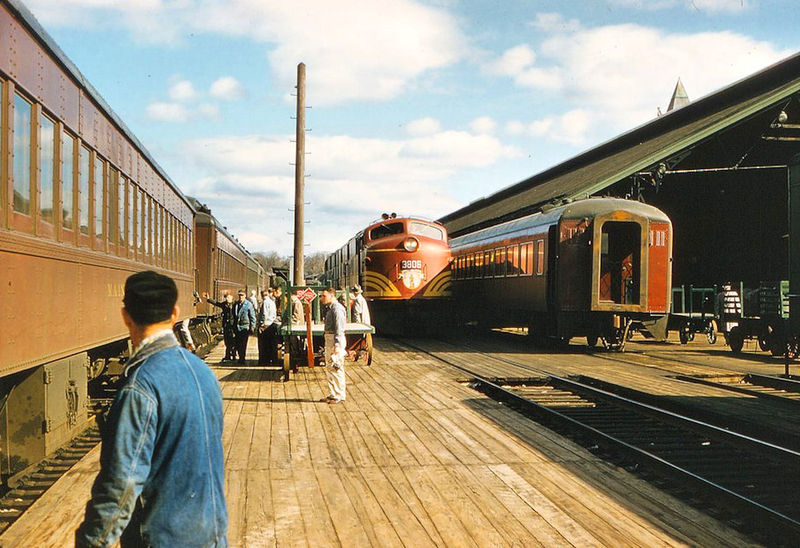 With growing lack of support from the B&M's end Maine Central was granted permission to end all remaining passenger services after September 6, 1960.